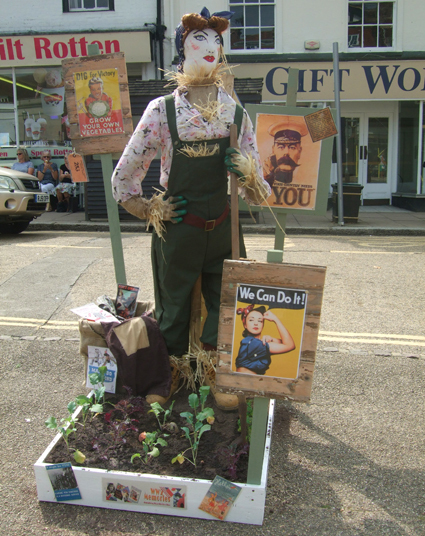 This fabulous Land Girl scarecrow is one of the entrants to Battle's 10th scarecrow festival, which runs until August 4 in Battle, Sussex. I visited the town at the weekend and took this photo. All the scarecrows were brilliant, but this was my favourite. I was also very taken with a wool shop's window display of knitted Suffragette dolls. I tried to photograph them too, but the lighting wasn't conducive to getting a good picture. Anything to do with the folklore of dolls fascinates me and there are just so many different aspects to what scarecrows can mean. Traditionally, of course, they were intended to stand in fields to protect seeds and crops. However, they have gained a life beyond that of looking like an angry farmer in an attempt to keep away birds. In some tales they really do come to life, either as helpers and companions - in the Wizard of Oz, for example - or as monsters in horror stories. I blogged about that back in 2010. Nowadays, in scarecrow festivals, they are used to commemorate individuals and events, to promote businesses and just for a bit of fun. I've even seen scarecrow dolls for sale, some of which I photographed in the picture to the left. I do think there is something rather magical about all of them. While kitchen witches are guardians of the hearth and home, scarecrows guard the fields and gardens. Although they are traditionally made in springtime to keep birds from sown seeds, you can make a scarecrow doll at any time and charge it to guard your outdoor spaces. 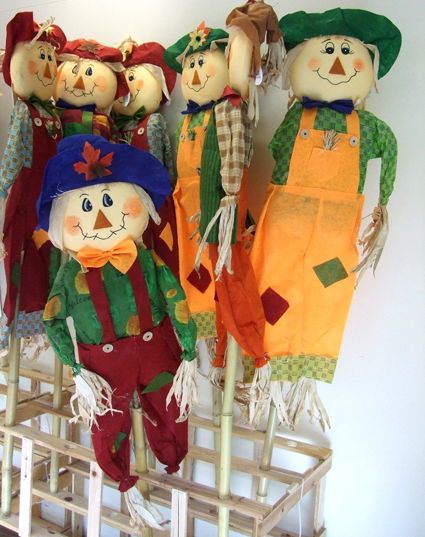 Scarecrows are usually made from old clothing stuffed with straw, with a stuffed pillow for a head, then tied to a long pole. If you only have a window box or a balcony with plants, you can make a miniature version of a scarecrow, cutting small clothes and a head out of old garments or felt. Tie the scarecrow to a stick and put it in a flowerpot full of soil. You view Pagan Portals - Poppets and Magical Dolls on Amazon and can also view the book at publisher Moon Books’ website.